Setup Area: Table recommended to use canopy tent. 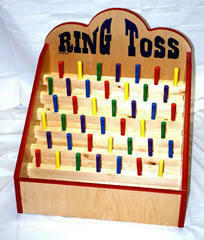 Ring Toss Pegs with rings classic carnival game. Toss rings onto pegs to win. Requires table, recommended to use canopy tent.